James has been cleaning my carpets fot almost 20 years. As long as he is in business I will never use any other company. He is so honest and fair, and his work is impeccable! My experience with James was great, he’s a genuine person easy to talk and easy to get along with. He did a phenomenon job on cleaning our carpet. He was fast and efficient the company he runs really lives up to its name. I would definitely recommend Top Notch Carpet Cleaning to anyone that needs there carpet clean. Thank you James, I really appreciate your hard work. We couldn't be more pleased with the quality of service that James provides. He is exceptional in every sense of the word. James is very personable with the family, stays in constant communication, arrives on time, goes above and beyond on his service and always leaves us with that "wow" factor when he has completed his work. He is a true man of his word and it's clearly evident he takes enormous pride in his work and with his company. We can't recommend him enough and wanted the best service for our brand new home. James continuously exceeds our expectations. This is how a business should be run and if only other businesses could model his ethics and true customer service! James has cleaned our carpet several times. He's always on time, fair priced and very knowledgeable. Have been using Top Notch for a couple years. Very fair in price and a definite top notch job. Would highly recommend James to anyone. I have been using James for my personal and rental properties for over 10 years and he does an exceptional job every time. He is very thorough and very careful not to damage door frames, wood floors, etc. I highly recommend him. James did a great job! He was polite, friendly, gave me a great price and best of all he showed up on time! He was efficient and handled all my furniture with care. I had him leave a stack of business cards so I could refer my clients to him. If you need a job done right go to Top Notch carpet cleaning. James is great to work with and knows host stuff! We thought our carpets couldn't be salvaged... until we met James! Our living room carpet was quite stained from the previous residents, and the Rug Doctor we rented didn't get the stains out. Despite our diligent vacuuming, I still faced allergy issues in our own living room. We're about to have our first child, and I was feeling desperate to know our floors were clean (but we couldn't afford new flooring). James called us back quickly to get scheduled, was on time, did the job quickly and very affordably, and I couldn't believe what I saw when we returned home. HE IS A MIRACLE WORKER! My husband and I are so happy we put our trust in him instead of going into debt on new floors. You gotta go with this guy! The only two regrets I have: 1) I cannot give more than 5 stars and 2) I didn't take a before picture to post along with the finished product. I have an EXTREMELY light carpet, and 2 young children. Enough said. James did a fantastic job. Not only is the carpet great, but the room has a fresher smell. THANK YOU JAMES! I will be using you again in a couple months before we move into our new home. James at Top Notch is the best; genuine, reliable, efficient and thorough. I always feel like I just moved into a new house after he cleans our carpets! So crisp and clean. James is kind, knowledgeable and has great rates! He helped us out a lot with pet urine problems we had in our carpet. He's our "go to" carpet guy ~ we highly recommend him! James always does a great job. Very friendly and considerate of everyone. they got out. Job well done! I will definitely call them again. I am super pleased! My carpets came out beautiful, they look and smell wonderfully clean. Along with other rooms of carpets, I also have a living & dining room of light beige carpet which EVERYTHING shows on them, it's hard to stay on top of "spot cleaning". Being a gardener and animal owner, I am guilty of walking with my garden shoes on my carpets, plus my 2 cats that are always shedding....all this makes for dirty carpets. Well, Jim and Nick made my carpets smell so good again. YES!! This company is easy to work with and they care about doing a good job for the customer. I plan to use them every year from this point forward, because I am ONE HAPPY CUSTOMER...thank you Jim and Nick!! James arrived with his colleague right on time. They did an excellent job and the price was phenomenal. We had just purchased this home and hadn't moved in yet. The seller had a cat and there was a definite odor because of this. The cleaning removed the odor and looked amazing. He was fantastic and the carpet looks great. I WILL definitely use him again! Exceedingly well. James and his Son arrived on time and completed the job sooner then expected. They were both detail oriented and spent more time on areas requiring supplemental attention. Additionally, we noticed two areas wherein some staining reappeared. We contacted James and he was more then happy to come out and do the touch-ups at no additional cost. Highly recommend! Will most definitely use them again in the future. James was on time and did a great job making very old carpet look better. I would highly recommend them. I will recomend this company to everyone! James was so nice and did a great job at a good price. My carpets look amazing! I will definitely hire this company for years to come! Thank you James! Im so happy! James was very apologetic for arriving 10 minutes late. He went right to work and completed the cleaning in about two hours. The results were excellent. I had resigned myself to replacing the carpets and was trying the cleaning as a last resort. But after cleaning, the carpets looked almost like new. James is a very conscientious professional whose expertise and superb equipment resulted in an A+ quality job. Hello, James showed 15 minutes early ready to work. Did a tour of the house and then began working. House was 4700 sqft and he was exact on his time estimate. All carpets were cleaned and looked great when finished. We liked his work so much we had him clean carpets in another property we own. Again he showed early and ready to work. Carpets came out great. We will use and recommend to friends in future. Price was very good. It was a pleasure working with James. James did a fantastic job! We had considered replacing the carpet, but after the cleaning, we realized that replacement was absolutley unecessary. James was friendly, trustworthy, and very flexible with our schedules. We left him a key under the doormat and a check on the counter because we had to work during his appointment. We came home to a beautifully cleaned carpet that looked like brand new! Thanks so much Top Notch! Great experience! I've recommended James to other home owners in the past and they've all been very happy, but haven't had the opportunity to use his services myself, as my home has hardwoods throughout. But I just bought a rental property with wall to wall carpet and I was afraid I would have to replace them--the carpet isn't the best quaility and they're a light tan color and there were spots I was sure wouldn't come out, partiuclarly where some furniture obviously sat and stained the carpet as well as mysterious dark stains along the baseboards. But James got right to work and not only reassured me that the carpet had some life in it, but that he could get it looking good and he really did! When he left, the carpets looked great and were only slightly damp, so I could continue doing some work around the house and with the heat turned up, they were almost fully dry w/in 6 hours or so. Smells clean, but not perfumey. James is honest, professional, prompt, and friendly. He arrived a few minutes early and was finished within an hour. The carpets look beautiful and he gave me the coupon price, without me having to print the coupon. James let me know that he would come back out, free of charge, if there was any residual soap or dirt (there wasn't). I would highly recommend Top Notch to clean your carpets. James is fantastic! James from Top Notch showed up right on time. He cleaned a bedroom carpet that smelled like dog. It smells great now. The dog smell is totally gone. He also cleaned a family room carpet that was really dirty and stained. All the stains are gone and the room looks awesome! Last but not least, he cleaned a white chair that is the favorite of one of the dogs. I cannot believe how good it looks! I will definetly call Top Notch when my carpets need their next cleaning. This is the second time we've used Top Notch Carpet Cleaning. Jim is so thorough, efficient and professional. You can tell he really cares about his customers and wants to establish long term relations with them. The carpets were cleaned and deodorized. His machine picks up so much moisture the the carpets dry really quickly. We highly recommend Top Notch and will continue to use him year after year. James arrived on time, looked at the areas we had to clean, and told me that he only considered it 2 rooms and a hall instead of 3. I appreciated his honesty and knowledge about different types of carpets and what holds up best with kids. Arrived on time. Was very friendly. Did an awesome job cleaning all our carpet and getting all the spots out. The carpet looks great! I will definitely use this company for all our carpet cleaning in the future. Mr. Marsh, who cleaned the carpets, is the owner/operator of the company. He was very thorough, used a deodorant on the carpets with no extra charge, and gave us a very good price. Absolutely no complaints at all. Very pleased. James worked me in at a time convenient to me, arrived on time, and started to work. I have a small house and do dog hospice, so the carpets were awful. It took him 3 hours, but he again worked a miracle and they looked great. The doggie odor was gone, and I could have guests again. Friends were amazed and pronounced him a miracle-worker. I don't know how he does it. He's always patient with me, kind to the dogs, and has a sense of humor too. It is amazing; he's honest, profession, great at what he does, and the best value around! We had purchased a big deal for the service, and it was great. He was so friendly and flexible, and I would defintely work with him again. We had to reschedule a couple of times, and he was really good about it, and made it work. That was amazing. The service was excellent and on time. He was very professional and even did one rug without any additional charge. Will use it again in future. James did a great job and scores "extra high" in customer service! Having previously rented my home to someone with a dog, there were some pet stains on the carpets that I wasn't sure would come up. Because I wanted to clean the carpets at the end of my remodeling efforts but needed to know if I had to replace carpet earlier in the process, James provided some of the pet cleaner to me in advance to determine the likelihood of the stain coming out. And it did! I would not hesitate to recommend James to friends. In fact, I already have! Great! Answered the phone, gave and estimate and scheduled on the first call. Was prompt, kind, and professional. I left him at the house after showing him around. He did a beautiful job; I was very happy with the results. The carpets were much cleaner and dried much more quickly than I expected based on previous carpet cleaning experiences. Will keep him on my list for all future carpet cleaning needs. James and his son - unlike other carpet cleaners - adjusted his busy schedule to come over and take care of my challenged carpet. James also (unlike the competitor I had called) was able to inform me by phone as to an approximate price that it would cost me. He and his son were prompt, super friendly, speedy, informative - I got straight forward answers to my questions, and amazingly effective!!!!! My carpet did not look as clean as they got it when I moved into my house nearly a year ago. The prior owner had 2 cats and 3 dogs and there were stains from her animals (which I had cleaned before I moved in, however, they did not disappear and/or they returned) and my 2 dogs had had several accidents that I had cleaned up but stains remained. I can hardly believe what these 2 did to my carpet - all the stains are gone, it smells fresh, and no stains have returned. I find them and their work magical. His card is on my frig and I am delighted to have James as a significant resource for my home. I was so happy with Top Notch Carpet Cleaners when they first deodorized and cleaned my upstairs rooms and stairs that I have called them 2 other times. The first time, they deodorized and cleaned my upstairs bedrooms and stairs. The second time they deodorized and cleaned my downstairs carpets, and the third time they cleaned my couch and cleaned a big stain in the dining area. All three times Top Notch were very professional, courteous, and friendly. When the father and son team first arrive, they inspect the area, tell me what to expect including time, and answer any questions I have. They then start deodorizing and cleaning. I have been so happy with the results of all 3 visits that I plan on using them from now on. I also will recommend them highly to family and friends. James called the morning on the appointment to confirm the time, and then he and his son showed up right on time. They were only on site about one hour, and did an excellent job. James and his son were very friendly, professional and obviously knew what they were doing.We are very pleased with the job, and will definitely use them again in the future - as needed. This was the second time I used this company. They were very polite and professional from the time of scheduling until completion. They did a great job on the carpets and get them cleaner than any other company I've used. It is a small family owned business so the owner is the one who cleaned my carpets. They did not charge extra for any of the pretreatments or try to upsell me on anything...just one flat price which was a great deal. They showed up right on time and were very professional and pleasant. I would definatley use them again in the future. Carpet looks and smells great. We had short deadline and he changed his schedule to fit us in. He was on time and got right to work. Very friendly. Also, offered to come back free of charge for possible stain issues. Really appreciated this even though we didn't need that additional service. Price very reasonable. Left email with service provider. Service provider promptly called me to schedule service. They were very professional and provided a quote over the phone. On day of service they contacted me to let me know they were running early and if they could arrive about 1/2 hour early. They performed the service, moved furniture that was too heavy for me to move out prior to the service and applied deodorizer. They were quick efficient and worked on the few stubborn sections. Carpet looked great. Thanks James ! We would use him again. Great value for the price. We have had several other carpet cleaners come to our home over the years and none came close to the excellent job James Marsh and his son, Nick, did in getting our carpets clean! They both were personable, professional, and did far more than I even asked them to do. The edges of the four steps as well as the steps themselves from the family room into the kitchen had a lot of ground in "dirt" due to where people tend to walk closest to the hand rail, and James spent some extra time getting them clean. The family room carpet was our main concern, and the area in front of the couch and the easy chair had some darker dirty areas from people sitting there often; they both looked SO much better after James was done. They put down blanket-like protection pads to cover the uncarpeted floor areas, and took care not to damage anything. The carpets were soft and did not feel like residue was left behind when they finished. They gave us some plastic shoe covers to wear until everything was dry, and those were handy to have to avoid tracking any dirt back onto the cleaned carpets. After many disappointments with other carpet cleaners, I am pretty happy to have found these guys off of Angie's List! I am certain we will see them again! This is the second time I have used James for carpet cleaning and I'm once again, VERY happy with the results. James is the owner and operator of his company. He schedules his own appointments and regarding punctuality to your appointment? Plan for him to be EARLY!!! That's the way he works. He's very busy, but he's very much worth the futurre booking you need to do to insure his services. Very professional, personable and worth the money, he was in and out of my home in an hour. Best of all, the carpet (4 years old), looks and feels like new again. I'd highly recommend Top Notch Carpet Cleaning to anyone who needs that kind of service. I'll be calling him again in the future. Carpet, in our new, empty house, really filthy after renters moved out. The owner, James Marsh, did incredibly well in getting out stains that I thought would be permanent. Carpet looks new now. He was able to tell that the carpet, in this 9 year old house, had all been replaced with good quality carpet in all rooms but the walk-in closet. This was good information to have. James was careful in protecting the walls, stair corners and hardwood floors. He cleaned 4 rooms and double stairs and got out all stains. I was very satisfied and he managed to deal w/ a stain previous cleaners could not get out. Very personable! Cleaned whole house as a move out service. It was a large home. We have used James a number of times in the past. He is honest, fair, fast, very hard working. I wouldn't use anyone else to clean my carpets. Give him a try he will be the only carpet cleaner you will ever use. Fantastic prices . James did a fabulous job on our carpets. They're old and stained, but he made them look like new. So much better than the company we used 6 months ago. Excellent service. Showed up on time, and performed the service within the time period. Very friendly. Good value. James arrived on time and spent five hours cleaning seventy upholstered padded chairs in our break room. The chair fabric was extremely stained and dirty but James worked very hard to get them looking almost like new. If you are looking for someone who has pride in their work, I would definitely recommend James. James is the best, and provided great customer service! He was quick to return calls, and was super friendly. James arrived promptly at my home in the morning, and was very respectful of my home. The carpets in my home have never looked better!!! I would absolutely recommend James to anyone! Clean and deodorized carpeting. He was very punctual, did the work well in a timely fashion. He's very personable, cleaned up after himself. James was awesome! We've lived in our home for 8 years with two dogs, a cat and three kids, and we've never had our carpets professionally cleaned. When James left they looked like new! It was amazing! We would definitely call him again. We have used plenty of carpet cleaning companies over the years and James was by far the best. We just moved into a house that needed carpets cleaned desperately. There were stains I really wasn't sure if they would come out. James did an amazing job! The original carpets from 1994 looked brand new! Highly recommend Top Notch Carpet Cleaning. He was professional and very courteous. This is the second time I have used James. He does incredible work - the carpet looked like new again. He is prompt in returning phone calls and is very easy to work with. James did a great job! He schedules his appointments quickly, arrives on time, and is very thorough and communicative. I will definitely continue to work with him! They came in-- father and son-- and worked fast and efficiently, did a great job, were super friendly, and the carpets had no 'cleaning' odor afterwards. Dealing with Mr Marsh was a absolute pleasure. He responded to my email right away and we set up an appointment for the following week. He and his son arrived at the appointed time and got to work right away. I have two dogs and a 2 bedroom home w living room, family room, hallway and stairs. He did an amazing job! The carpets took terrific! I highly recommend this guy. Friendly, professional and courteous. Thank you Mr. Marsh. They cleaned carpets thought out the house, including a hallway and stairs. I believe we got the 10-area package. James and his son were very personable, and James was particularly attentive when it came to removing odors from the carpet in the basement. We could not have been happier with his service! friendly, and didn't try to sell me extra services...! Fantastic job! Very happy with friendly, professional service and quality of work. Carpets look amazing. This is the third time we've hired James. We continue to be impressed with his work ethic, punctuality, professionalism, friendliness, and high quality work. When it comes to carpet cleaning, we look nowhere else; James is our choice hands down, every time. James and Nick cleaned both a large carpet and stairs. They were friendly, called ahead and actually arrived earlier than had been mentioned at time of appointment which was great. They did a great job on both. There were numerous pet marking areas which were spot treated and the odor which was noticeable at times before, has been removed. I had originally just requested the large carpet to be done, but James just asked if I wanted to do the stairs, no hard sell, and I decided to go ahead for a fair extra charge. Great service! This is the second time I've hired him and he does a great job, service and at a great price. He's even got better equipment than the national guys. This was the best carpet cleaning service I have used to date. The customer service was phenominal, there was constant communication about the job. The service itself was well worth it. There was a wood stain that I did not think could be remvoed and it was. I will be using this company for all my future needs. He was prompt and professional, and explained the quality of our carpet any pointed out an area that someone he had tried to clean with a carpet cleaner, which had bleached out the color. Very nice to talk to. The Service was excellent. He showed up on time and started working right away. We had a lot of pet stains from out new puppy and he was able to remove them all He also got the edge of the carpet that abuts the kitchen floor clean which the last two cleaners I had said they wouldn't be able to do. He also used an adapter to get into the edges and under the cabinets which again the last cleaner said he could not reach. So far none of the stains have lifted back up. James did tell me it would probably happen at some point but at least it wasn't within a week like the last time I had them clean. The cost was less them I expected but I would have paid more for the excellent service. They our definitely on my favorites list and will use them again. Excellent! They were very prompt in getting scheduled, showed up right on time, and went right to work. Done with all our cleaning in 2-1/2 hours! Results have been great. James showed up on time and did a great job. The carpets came out looking great. I had never had carpets cleaned before and was concerned that they would take a long time to dry and would leave residue that would cause them to get dirty again quicker. I had several e mail exchanges with James and he assured me his technique of cleaning and extracting the water would not cause this issue. I was originally going to go with Zerorez, but after seeing some of there reviews I decided to use Top Notch Carpet Cleaning. It was a good decision, he did a great job and was very courteous and personable to work with. I will use him again the next time the carpets need cleaning. We have Top Notch come every 6-12 months. They do such a great job in cleaning and getting the most water out afterwards so that carpets dry really fast. We've always been happy with their promptness, service, and professionalism. James arrived promptly as scheduled, and set right to work. He helped me move my large sectional sofa, and was careful about getting every area of the carpet cleaned. We have 2 dogs, 3 cats, and 3 kids, and it had been a year since our last carpet cleaning. So needless to say, the service was greatly overdue. James did a fantastic job and my carpets look great! I will definitely be calling him to come back and take care of our upstairs rooms and stairway soon. James was very responsive and came out to clean the carpets of our vacant rental unit three days after our initial contact. The job was transformative and his price was reasonable. There were a couple of stubborn stains that he was upfront about. His communication before, during, and after the job was excellent. We would definitely hire him again. Top Notch followed up promptly to set up the appointment, showed up on time and well very professional. They did an excellent job with my carpets and would definitely hire again! This is the fourth time we've used Top Notch. Always a superb job. His equipment is really powerful, so most of the water is removed, and the carpets were dry by the end of the day. And clean! We were able to schedule an appointment very easily. He was prompt, pleasant and professional. One of the bedrooms had some small stains and he was able to get those out. We will use James again! James showed up on time and was energetic. Our seven-year old carpets look and feel brand new. We'll definitely be using Top Notch Carpet Cleaning again! On time, polite, no extra charges. Hire them again. It went great. James showed up on time and performed services as expected. I contacted him the Saturday before service was scheduled to see what chemicals were used. He was happy to take the time even on a Saturday to explain his process and cleaning products and offer a completely green product as well. Overall good service and he got the carpet really clean. They arrived on time, went right to work, were careful with furniture left in room and placed foam blocks under when carpet cleaning complete. There were additional costs for stairs and treatment, but these were stated up front. I had purchased a home and had just obtained the keys.The previous owner had a large dog and most of the carpets were in need of a good going over. The gentleman was very accommodating in adjusting his schedule to fit with mine. He did an excellent job at a decent price in a timely manner. And that's what it is all about, isn't it ? I will hire again without hesitation. James did a fantastic job cleaning the carpets. He's prompt, professional and always does a great job getting the carpets clean! I use him for my personal home and refer him out to my clients as well…he's the only carpet cleaner I trust. He was very friendly and did a great job. He even cleaned an area carpet for a reasonable price, and did not charge extra for an additional front closet. I used him an additional time for another home that I own, and he did an equally good job. Made contact, arrived on time, completed everything very well with no muss, no fuss! Will hire them again. Oh, and the price was just right or maybe a little low for all their work. We have had our carpet cleaned in the past by another reputable company with just OK results. Our carpeting is light beige in color; as a result, dirt and traffic patterns are very noticeable in certain areas. Previously, we saw only minor improvements We read reviews on Angie's list of several highly-rated companies and chose to go with James Marsh, owner of Top Notch Carpet Cleaning. He was responsive to our telephone calls, accommodating to our scheduling requirements, punctual, and--above all--did a fantastic job of cleaning our carpet. He was particularly attentive to those areas of heavy traffic problems. Bottom line, our carpet has not looked this nice for years. James did all the work himself. It is obvious that he takes pride in his work and certainly offers "Top Notch Carpet Cleaning". His price was reasonable. In the future, we intend to have him clean our carpet every year. James was great -- very professional, punctual and considerate of our recently refinished hardwood floors on the main floor. He was extremely punctual (a little early which was delightful!) and his estimated time was perfectly accurate. I won't look for another carpet cleaning provider again. James is my solid choice and I've already referred his name to my son and daughter-in-law. Starting upstairs we reviewed service, targeted problem areas and confirmed agreed price. Took approximately three hours of thorough professional cleaning. He explained drying time and recommended leaving fans on Seemed very clean and deodorized. Unfortunately our dog re-soiled one area shortly after. Dog-On-It! We're pretty sure he didn't like it so clean... Would highly recommend James Marsh and Top Notch Cleaning to Others. James was on time. He was very thorough and we were pleased with the results. I would recommend him to my friends. James was great at reconfirming our appointment the day ahead of time. He accommodated our schedule as best he could and that was very helpful. He was timely, friendly, professional, and seemed to really know his business. We will use him again if the need arises. This iframe contains the logic required to handle Ajax powered Gravity Forms. *Applies to regular business hours. After hours, James will attempt to promptly return calls as soon as possible. 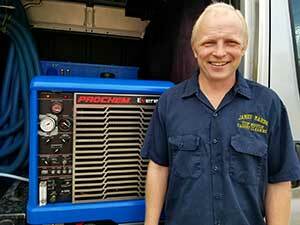 James Marsh owner-operator of Top Notch Carpet Cleaning has been serving the Portland metropolitan area since 1998. James prides himself in his commitment to each and every one of his customers, providing unparalleled customer service and is committed to serving your needs.